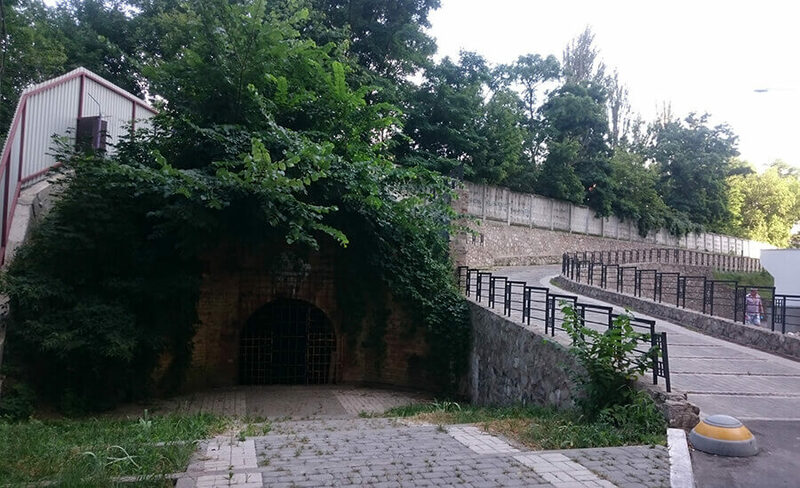 – Vasylkiv fortification was an independent fortification complex in the system of defensive fortifications of the Kyiv fortress. Star-shaped in terms of the form of strengthening formed the main rampart and ravelin, in front of which were a covered path and glacis. The fortress side of the fortification consisted of two round and central semi-circular towers (the reduite) – the barracks, interconnected by a brick wall with three gates. To maintain the earth ramparts in their corners were arranged brick on granite socle scaffolds (outer slopes of the rampart), and the inner surfaces of the parapet are lined with brick. In the dry outer ditch of the fortification there was an additional defensive wall that covered the approach to the flank batteries of the casemate type and the caponier standing in the rear of the ravelin. From the fortification area, the outer moat come through five posterns, located in the corners of the main rampart and near the round towers. The trees were preserved near the tower №2. If you want, you can walk along the tree, the contours of which are repeated Chihorin Str. and Branovytsky Str., and then go to the courtyard to the tower №3. Also part of the earth ramparts can be seen near the Prison Castle next to the tower №2. – Remains of earth ramparts. 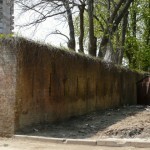 Vasylkiv fortification – fortification, built in 1831-1840 as part of the New Pechersk fortress (L.Ukrainka Blvd. and Konovalets Str.). The fortification consisted of Tower №1 (Reduit), Tower №2 (Round Tower), Tower № 3 (Prozorivska) and Tower №4, and also from the barracks of the military cantonists and Staro-Navodnytski Gate (not preserved). All the towers were connected by brick walls, and behind them were earthen fortifications with footways and caponiers. Later, next to the Round Tower, a Prison Castle was built. Since 1897 it has been converted into a warehouse. 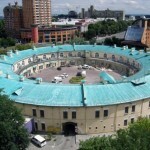 Today Vasylkiv fortification is included in the museum complex “Kyiv Fortress”. 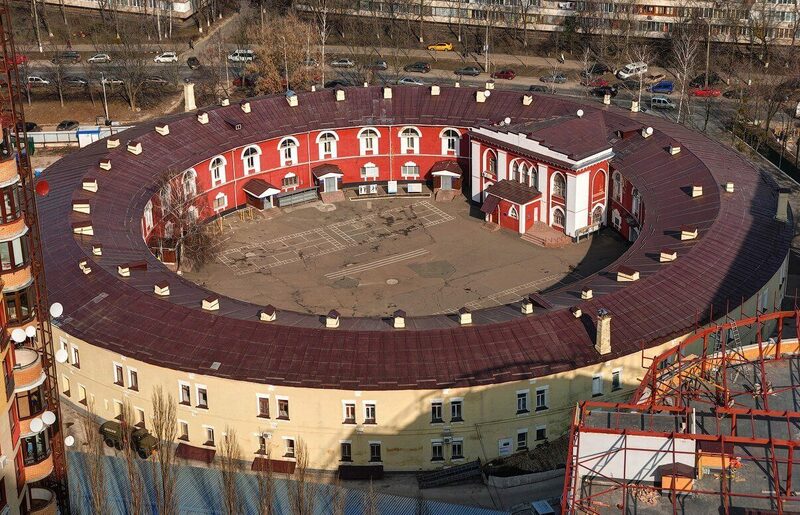 – Prison Castle – a construction in the structure of the Vasylkiv fortification, built in 1812-1817. 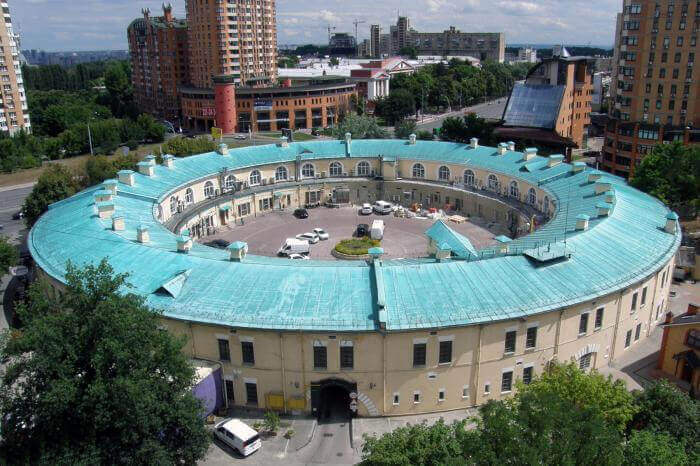 (Konovalets Str., 44-g) and designed for holding prisoners (up to 900 people). It was a complex of buildings surrounded by a wall-carpet (the height of the wall is 7 m, the length of the side is up to 100 m), with a courtyard, angular prismatic towers, and also buildings for kitchen, baths and other household needs. In the centre of the courtyard is a two-storeyed rectangular building – barracks for keeping prisoners. Since 1871 it was used to house a military correctional company, in 1880-188. – for the household needs of the military department. Today is in a dilapidated state. – Remains of the Fortress Wall. Once the tower №2 was connected by a wall with tower №4, but the wall was dismantled more than a century ago. 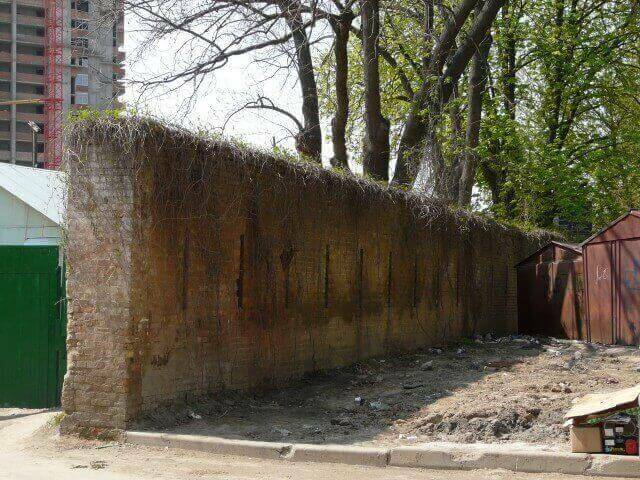 But almost completely preserved fragment of the fortress wall, stretching from it to the Reduite Tower №1. – Tower №1 – one of the towers of the Vasylkiv fortification, named – Reduit (Konovalets Str., 38). 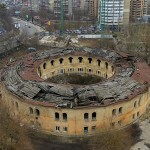 The construction of the semicircular form was built in 1831-1837. Later, gate appeared in the defensive wall to enter the courtyard. The tower served as a hospital, a barracks, or a prison. It was reconstructed. Today there is a military unit here. – Tower №2 – round Tower is the tower No. 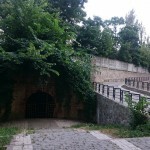 2 of the Vasylkiv fortification, which is a part of the complex of the Kiev fortress. 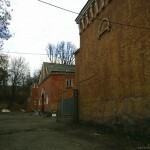 The three other similar objects began to be built on Pechersk in 1833. One of the most famous tower among them is No. 2. It is located on Lesia Ukrainka Boulevard, although the official address of the tower is Konovalets Str., 44. The tower was intended for a battalion of soldiers of the garrison. This is a two-story monumental structure with a small courtyard – a parade ground, with narrow embrasures on the outer wall. The windows of the barracks went into the inner courtyard of the tower. A number of tower rooms had been used as a political prison since 1863. There were grown windows on the external facades instead of loopholes and embrasures in 1897. The remains of the battle shaft, closely adjacent to the tower, were preserved until now. Today the restaurants and offices are represented in the tower. – Tower №3 – one of the towers that were part of the Vasylkiv fortification (Konovalets Str., 34). It was built in 1838 – 1839 years and was called Prozorivska in honour of General-Field Marshal A. Prozorivsky. 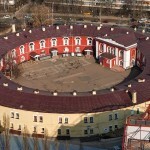 This is a two-storeyed structure of round shape with a courtyard paved with cobblestones. It was connected with the tower №1 by a stone wall with a gate. Originally there were military units. In 1863, the building of the tower began to be a military court and prisoners. Today, the military unit is located here. Reconstruction was carried out. – Tower №4 – the tower of the Vasylkiv fortification, built in 1833-1839 (Staronavodnytska Str., 2). In comparison with other towers it had small dimensions and was therefore called the “small tower”. 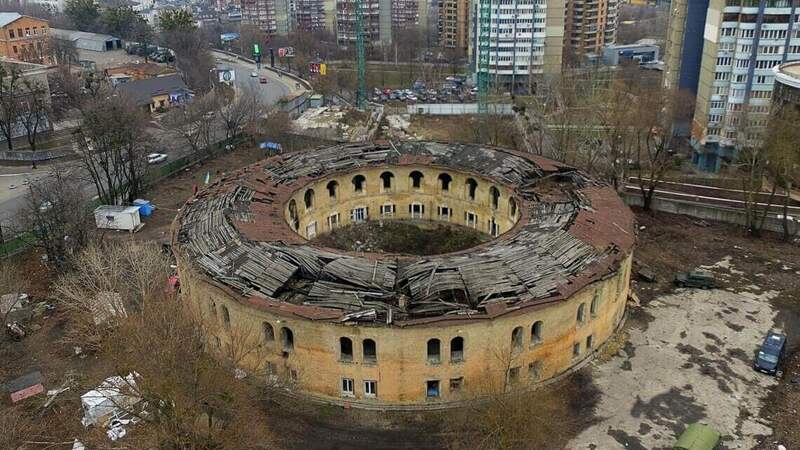 It is a brick circular structure with an internal cobbled yard. It was built like a barracks for two soldiers’ companies. From the tower to the barracks of the military cantonists there was a defensive wall with Navodnitsky gates (not preserved). At the moment the building is abandoned and no reconstruction has been carried out. – Barracks of military cantonists – built in 1835-1839 (Moskovska Str., 45). 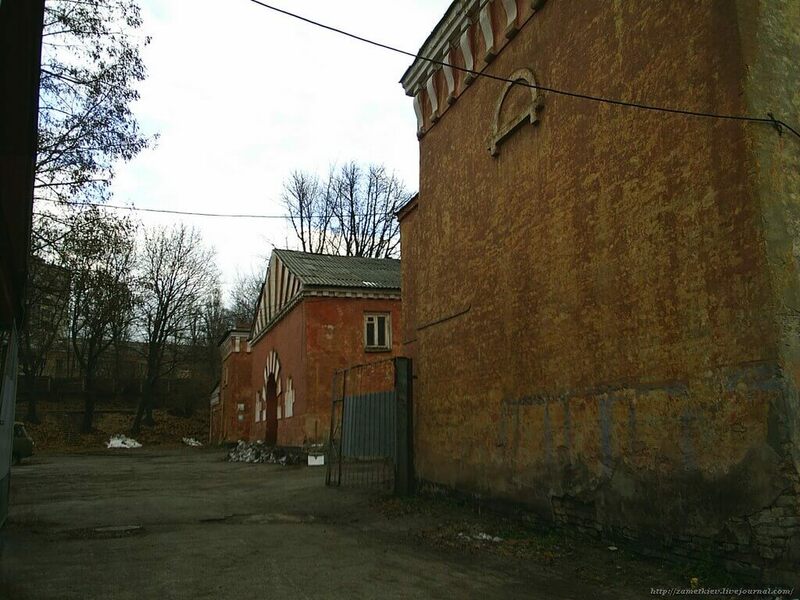 Between the barracks and the tower №2 was erected a fortified wall with Navodnitsky gate (not preserved). The structure was a long rectangular two-storeyed building, divided into sections – casemates. In the 1930s over the middle part of the building were built two floors, above the side – one. The structure has been preserved to this day, it was reconstructed.